Could Fish Be The Future Of Agriculture? APS post-doctoral researcher Dr Anastasia Kottara discusses how aquaponic systems may provide the answer to the sustainability crisis in agriculture. Anastasia works on a collaborative project between Grantham Centre Director Tony Ryan, Grantham management board member Duncan Cameron and the University of Sohar, Sultanate of Oman. This project is funded by a UK-Gulf Countries Institutional Links award to develop capability and demonstrate innovations in protected growing (greenhouses) for increased water use efficiency and food security in Oman and other hot, dry climates. The ultimate goal of conventional agriculture is to maximise yield and profit of crops – but this comes a terrific cost for the environment. Soil degradation, excessive usage of water and loss of biodiversity are all examples of environmental costs from conventional agriculture. With projections estimating the global population will rise to 9.8 billion by 2050, the need for sustainable agriculture that can meet the demands of future generations is urgent. Soil-less culture systems have recently been a major focus of agriculture research. In these systems plants grow without soil, either in a nutrient solution or a porous substrate. Food systems which target growing plants by providing the nutrients in water (hydroponics) or air/mist (aeroponics) as a chemical solution have already been implemented. However, even though hydroponics and aeroponics have both proven to be advantageous in terms of achieving high yields, these systems can still require a heavy chemical load. Thus, it is still debatable whether hydroponic and aeroponic systems are ultimately environmentally sustainable systems. 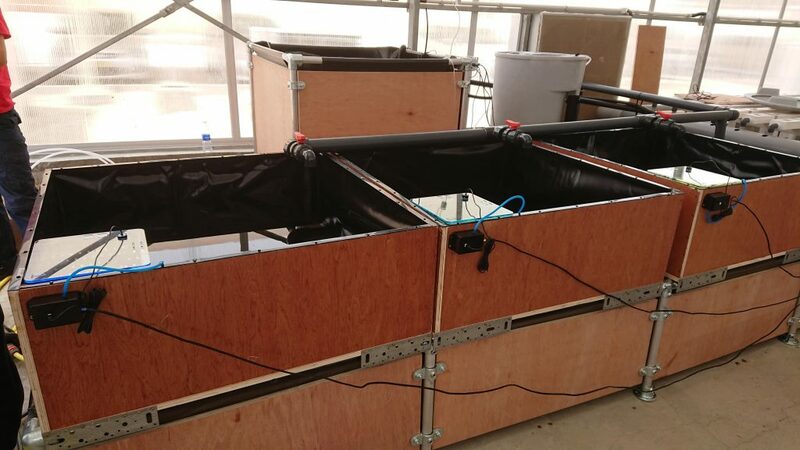 An alternative system, aquaponics, has been designed for food production. Aquaponic systems rely on fish wastewater as a nutrient solution for plant growth. 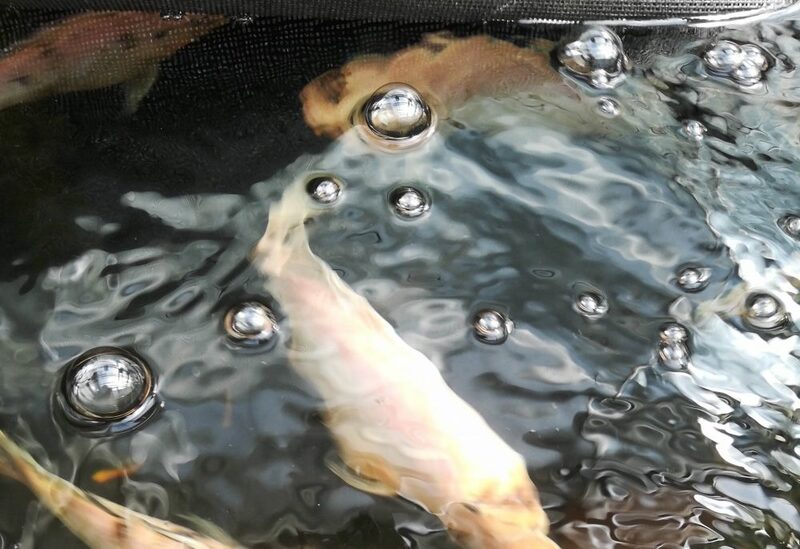 While in hydroponic systems, plant growth depends on a chemical supply, in aquaponic systems plant and fish growth are interdependent, with the fish supplying bio-nutrients to the plants while the plants uptake these nutrients and clean the water for the fish. This system does not depend on a chemical supply for the plants to grow, only requires 10-15% of the water used for food production and it can produce 4 times more food per acre compared to conventional farming. However, there are key challenges that need to be overcome in order to achieve easy maintenance and high productivity of aquaponics. A general challenge of all soil-less culture systems is the development of a growing substrate – one which has a high water holding capacity, does not decompose and does not alter the water pH. An even bigger challenge is the biological complexity of the system ? 3 different biological levels co-exist (microbes, plants and fish) ? and failure of one component can lead to failure of the whole system. As a result, water quality needs constant monitoring, fish and plant mass needs to be in optimum equilibrium, and microbial composition and activity need to be frequently assessed. In a British Council Institutional Links-funded project, me and my colleagues have been tackling these challenges. 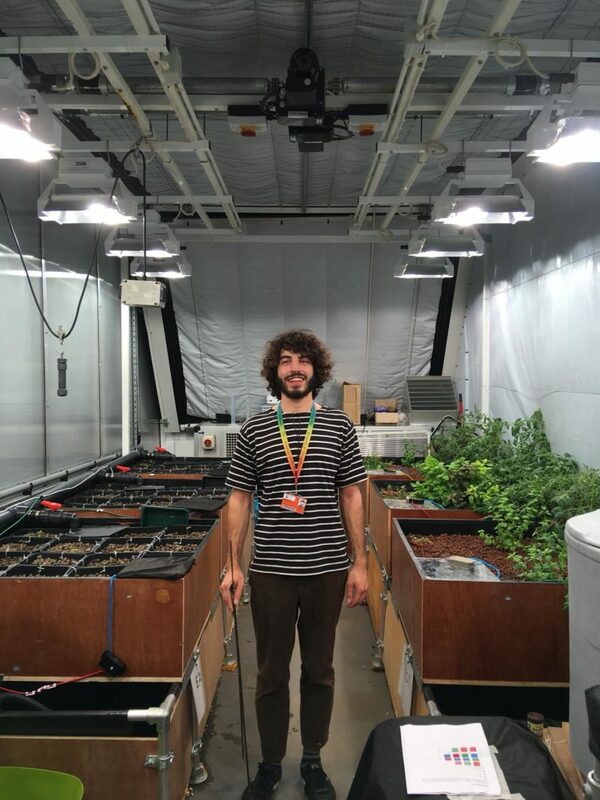 Joint experiments are being conducted in The University of Sheffield’s Arthur Willis Environment Centre (a world-leading climate controlled plant growth facility representing investment of £4.5 million by The University of Sheffield) and will be replicated at Sohar University in Oman. The design of our system is simple and consists of a fish tank with a water filter and plant beds with a water sub-tank. We are examining innovations in soil-less, enhanced growth media, made of polyurethane (PU) foam to use as a substrate in our aquaponic system. Expanded clay pebbles are currently the standard aquaponic growing substrate, which, apart from having a very low water holding capacity, are made in a process that involves roasting the clay (to expand) in massive rotary kilns under extremely high heat of 500 to up to 1,000 °C. Thus, in addition to concerns about the performance of the substrate, environmental concerns about the roasting process mean this is not an ideal candidate for sustainable agriculture. In this project, we are optimising PU foams to be used as synthetic soils for the cultivation of high value horticultural crops (e.g tomato plants). Pilot experiments testing PU foams with high water holding capacity versus expanded clay pebbles have already started. The results of these experiments will indicate the performance parameters of our substrate. Future research will be focused on growing tomato plants alongside multiple herbs (e.g mint, basil) and leaf vegetables (e.g lettuce) in a matrix made of PU foam where the microbial composition and the optimum conditions returning the highest yield for each crop will be determined. 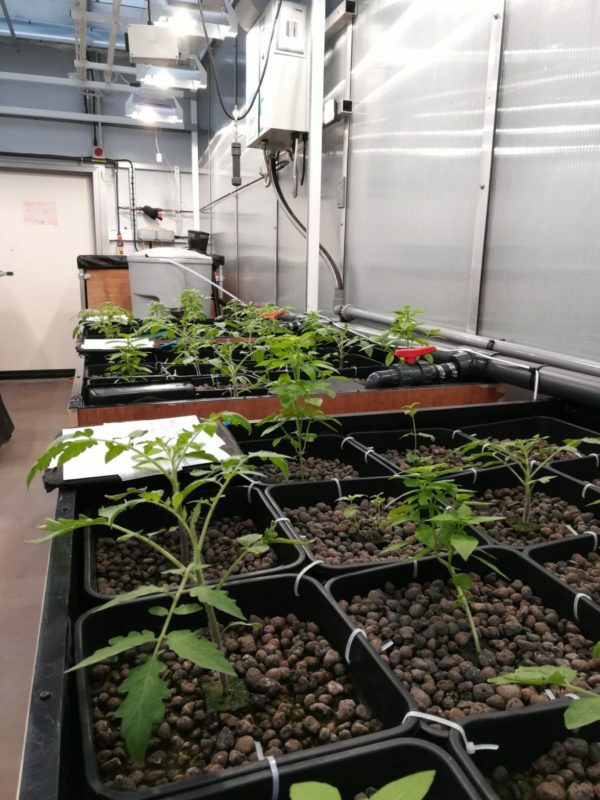 Following the results of these experiments, we will aim to enhance the microbial activity in our system by inoculating microbial communities beneficial to the plant growth. With this final step, we aim to further optimise our system in order to achieve higher crop yields. In this world-leading research project, we aim to design and optimise a sustainable agricultural system for food production. Looking at the past and the methods of conventional agriculture that have led us to water scarcity and soil degradation, we have designed a system which keeps a close eye on parameters that increase environmental sustainability. Soil-less culture systems like aquaponics are often biologically complex systems but the good news is that once they are fully understood and optimised, such systems may be able to feed 10 billion people.